I actually read these books in reverse order because Sweet Revenge was available on eARC first, but even knowing what I knew from Matt's story, I was able to really get into Shanes's story and enjoy them both. That being said, I recommend finding out all about Shane and his love for Josie before you learn about Matt's relationship with Laney! Her Love Can Save HimShane can't remember the blue-eyed angel at his bedside-or who he even is-but he knows something isn't right. His hearing is razor sharp, his physical strength incredible, and the urge to protect Josie overwhelming. For powerful enemies are hunting him, and Josie is the key to discovering why. As Shane struggles to unravel his past, dangerous new truths come to light. Can he protect the only woman he's ever loved? And can Josie trust a man she thought she knew-one who carries such a deadly secret? OMG - these guys are HOT! If you like military guys, a suspenseful romance or a ton of smart action, you need to read about Shane and Matt - and heck, you need to put your name on the list for books 3 and 4 right now! Believe it or not, the action takes a back seat to the love stories for me and the reason is that Rebecca Zanetti paired these two hot hunks with intelligent, strong women who could see beyond the situations they were put in and love the guys - despite the lies, history and current situations they face! Book 1 starts hot and heavy with the action and brings the love story out as the characters face the challenges of staying alive despite the threats against them. Book 2 starts out hot and heavy with the romance and leads you into the action in the second half of the book. 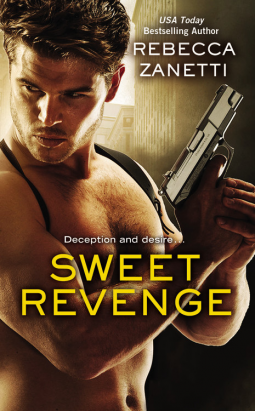 Despite having read the books out of order, I highly recommend reading Forgotten Sins before you read Sweet Revenge! I am totally ready for the other brother's stories and to see how Ms. Zanetti brings the continuity plotline to fruition! If you like romance, action, suspense and hot military guys, then you need to add the Sin Bros. series to your TBR Pile!